A certified emergency nurse must have specialized training to deal with critical medical situations. 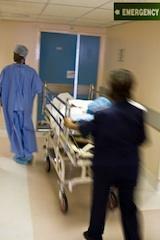 These professionals can work in various settings not limited to emergency rooms in hospitals. The emergency nurse is in close contact with the community and must be able to help people deal with difficult situations. The position requires knowledge of psychological issues that patients may experience in addition to clinical expertise. A trauma nurse specializes in acute injuries caused by trauma. Emergency nursing requires training with traumatic injuries as well as critical care for patients with life-threatening illnesses or medical complications. This type of medical professional is just able to treat a toddler with a broken arm just as well as she can treat an elderly woman with cancer. Student nurses may study emergency nursing as they earn their degrees or they may focus on trauma and sustaining life in critical situations in their studies. Emergency nursing requires considerable knowledge and skills. Practitioners must be able to effectively help treat patients during the initial phase of a medical crisis. At a minimum, it is necessary to have a degree in nursing to prepare for this type of work, whether a two-year associate's degree or a four-year Bachelor of Science in Nursing. In rare instances, nurses may earn a nursing diploma in a hospital setting, which takes about three years to complete. After earning a degree, nurses have to pass the National Council Licensure Examination for Registered Nurses (NCLET-RN). After passing the exam, the student has officially become a registered nurse (RN), and may practice in hospitals, doctor offices or many other settings. Nurses interested in specializing in emergency care will need to take additional courses and pass a certification exam to earn the Certified Emergency Nurse (CEN) credential. Many nurses train on the job and some take courses to learn about dealing with emergency situations. Skills must be demonstrated in order to earn certification. Taking the CEN exam begins with an application. Once the paperwork is received, the nurse has 90 days to complete the test. Examinations are given at designated areas on specific dates. At the site, those taking the test have to bring two forms of identification and the authorization letter. Details are available in the CEN Review Manual. Nurses may apply to take the CPEN exam to become certified in pediatric emergency nursing by applying online or by requesting a printed application by phone. It is important to wait until you are ready to take the exam because there is a 90 day window to take the test that begins once the paperwork is processed.